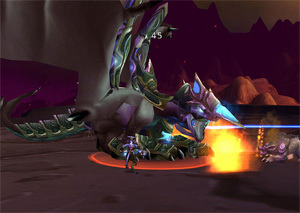 If you’re looking for the best way to level, instances are the answer on World of Warcraft. Instance leveling has taken over as the fastest way to level, for a variety of reasons. So exactly why does instance leveling take you to level 85 so quickly? Let’s take a closer look. Instance leveling definitely gives you more experience per second during every moment of your game play. Sometimes it may be difficult to tell, but there are just too many factors that go into instance leveling to make it a surefire way to get more experience per second. For example, you have a lot less downtime in between kills. You will take on mobs of four or five all at once in some cases, which means you may have four or five kills in just 30 seconds or a minute. Compare that to just one kill per 30 seconds or a minute when you’re solo questing, and you’ll see what I mean. There’s also a lot less travel time in between kills when you’re instance leveling. For one thing, you don’t have to spend a lot of time traveling from place to play, and when you are traveling, you’ll be able to queue up for an instance while you’re en route and pick up some more experience in instances along the way. The dungeon finder takes you right to your random or specific dungeon instantaneously, no matter where in the game you are. It eliminates the need for travel time to get to these instances, and you’ll spend a lot more time killing creatures and getting experience because there are far more mobs packed into a smaller space in instances than there are out in the solo questing area. Instance leveling will also help you make a lot more WoW gold. Previous leveling methods sometimes resulted in toons getting to level 85 with little or no gold, especially if you used the refer-a-friend bonus and received 30 levels overnight. However, instance leveling gives you a lot more access to things like enchanting materials and cloths, which can be sold on the auction house for a lot of gold. It may not seem like much to sell a stack of linen cloths for one or two gold pieces, but it adds up after a while, especially if you’re instance leveling and picking up linen cloths right and left. In fact, players who used the refer-a-friend system to gift each other those 30 levels will find that it is much easier to gear up to the level they are and catch up with the amount of WoW gold they need to be effective at their new level. After all, those 30 levels can’t take you to level 85 (although they certainly take you a long way!) because of how the refer-a-friend system is set up, so there will still be the need for instance leveling after you receive your 30 levels.